You can take one of two approaches for requiring two-step verification, both of which require using a global administrator account. 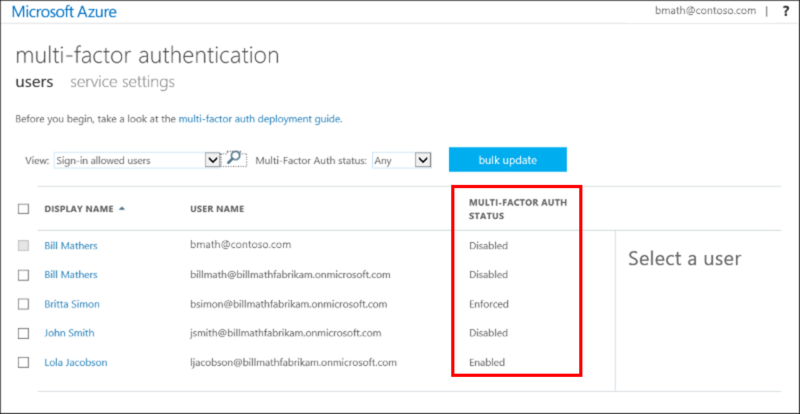 The first option is to enable each user for Azure Multi-Factor Authentication (MFA). When users are enabled individually, they perform two-step verification each time they sign in (with some exceptions, such as when they sign in from trusted IP addresses or when the remembered devices feature is turned on). The second option is to set up a conditional access policy that requires two-step verification under certain conditions. Choose one of these methods to require two-step verification, not both. Enabling a user for Azure Multi-Factor Authentication overrides any conditional access policies. Enabled by changing user state - This is the traditional method for requiring two-step verification and is discussed in this article. It works with both Azure MFA in the cloud and Azure MFA Server. Using this method requires users to perform two-step verification every time they sign in and overrides conditional access policies. This is the method used for those with either Office 365 or Microsoft 365 Business licenses as they do not include conditional access features. Enabled by conditional access policy - This is the most flexible means to enable two-step verification for your users. Enabling using conditional access policy only works for Azure MFA in the cloud and is a premium feature of Azure AD. More information on this method can be found in Deploy cloud-based Azure Multi-Factor Authentication. More information about licenses and pricing can be found on the Azure AD and Multi-Factor Authentication pricing pages. Enabled The user has been enrolled in Azure MFA, but has not registered. They receive a prompt to register the next time they sign in. No. They continue to work until the registration process is completed. Yes. After the session expires, Azure MFA registration is required. Yes. After the access token expires, Azure MFA registration is required. Enforced The user has been enrolled and has completed the registration process for Azure MFA. Yes. Apps require app passwords. Yes. Azure MFA is required at login. Yes. Azure MFA is required at login. A user's state reflects whether an admin has enrolled them in Azure MFA, and whether they completed the registration process. All users start out Disabled. When you enroll users in Azure MFA, their state changes to Enabled. When enabled users sign in and complete the registration process, their state changes to Enforced. Go to Azure Active Directory > Users and groups > All users. A new page that displays the user states opens. 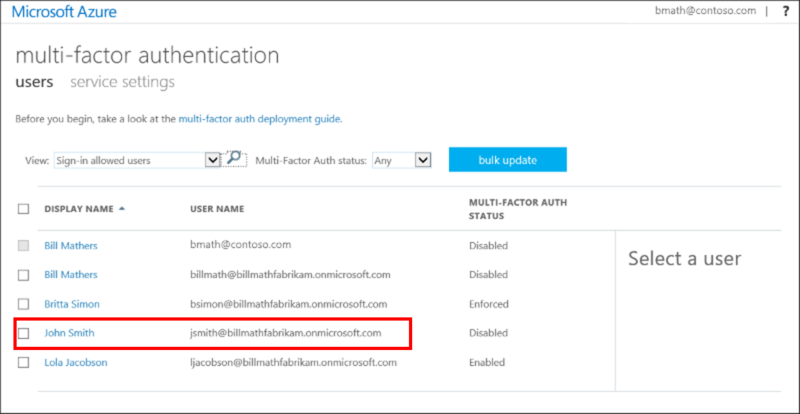 Use the preceding steps to get to the Azure Multi-Factor Authentication users page. Find the user you want to enable for Azure MFA. You might need to change the view at the top. On the right, under quick steps, choose Enable or Disable. Enabled users are automatically switched to Enforced when they register for Azure MFA. Do not manually change the user state to Enforced. Confirm your selection in the pop-up window that opens. After you enable users, notify them via email. Tell them that they'll be asked to register the next time they sign in. Also, if your organization uses non-browser apps that don't support modern authentication, they need to create app passwords. You can also include a link to the Azure MFA end-user guide to help them get started. Don't move users directly to the Enforced state. If you do, non-browser-based apps stop working because the user has not gone through Azure MFA registration and obtained an app password. Why was a user prompted or not prompted to perform MFA? See the section Azure AD sign-ins report in the Reports in Azure Multi-Factor Authentication document.